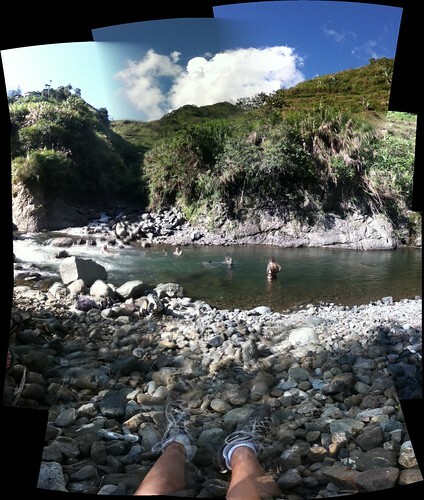 View from Cambulo River, Cambulo, Ifugao. 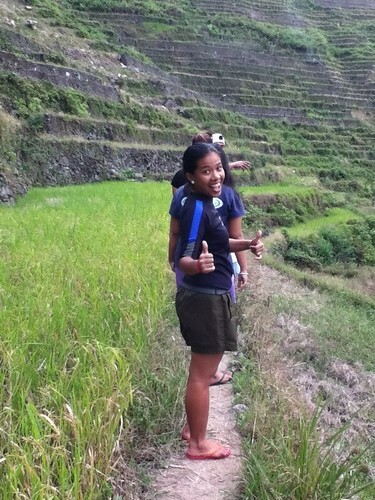 We got up close and personal with the Banaue Rice Terraces. When I was younger, during Sibika at Kultura class, I thought one could step on the terraces as if they were in an ordinary staircase. Jil was really happy. Everyone was. Traditional huts were meant to shade the farmers from the sun. 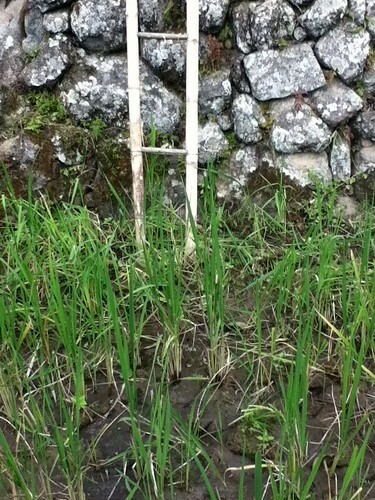 The rice paddies weren't that green because the harvest season was already over. Our guides told us that the perfect time to visit is on March or April, but then again, one has to contend with the deluge of tourists from all over. 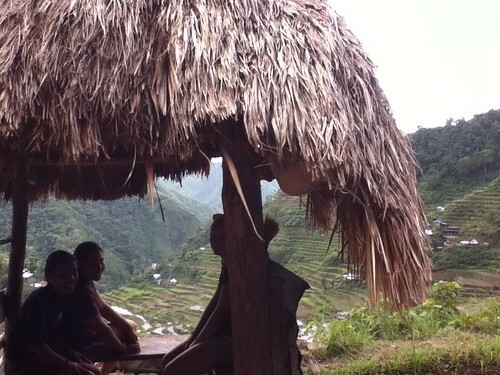 My brother invited me to join him on a trip to Banaue Rice Terraces with friends from our church and his workplace. Anxious that I might be missing class (I didn't know January 23, Monday, was already declared a non-working holiday), I said "yes" at the very last minute. The email, detailing the itinerary for the next three days or so, had clear instructions, but this one particularly stood out: pack lightly. I met the rest of the 14 members of the Kaladkarin Society (also the name of the Facebook group where various announcements were posted)—Liw, Lheiya, Ralph, Josiah, Katie, Sally, Me-Ann, Liana, Frances, Jil, RJ, Dingdong, Joan, and Celle—at the Ohamiya Ohayami Bus Terminal at 10 PM, Friday. I hadn't met all of them yet, so I was really excited. They were very warm and welcoming. It was a good thing we had booked our tickets days before. The bus was packed. And I mean really packed. 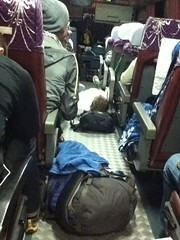 Chance passengers were seated in monobloc chairs in the aisle. 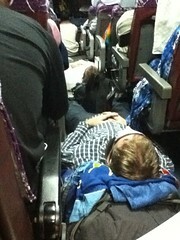 Some Dutch, possibly German, tourists did not have enough leg room, so they decided to sleep on the floor, oblivious of us who frequently stepped on their bags during stops. 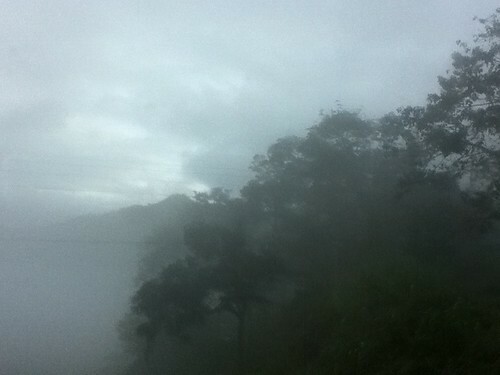 I slept for most of the eight-hour ride, and when I woke up, this scene greeted me. We were on top of the mountains. 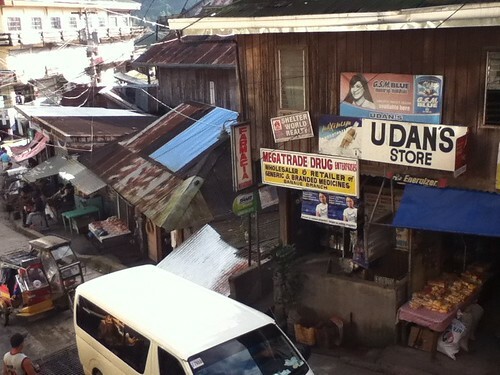 Finally we arrived at the center of Banaue and had our breakfast at People's Lodging. The trick is to order 30 minutes to a hour because it takes them that long to prepare the food. While waiting, we decided to explore the area. The air was cold and refreshing. 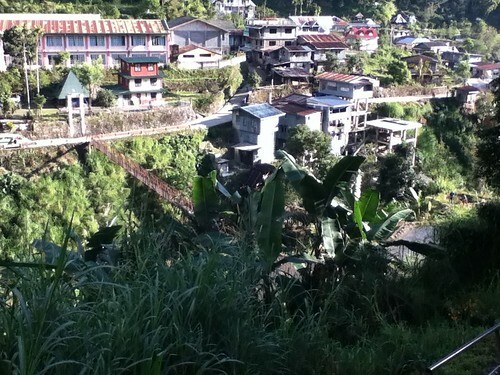 Banaue is a fourth class municipality of Ifugao Province. 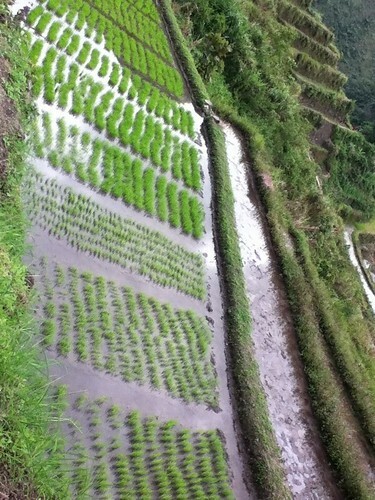 Worldwide it is widely known as the home of the Banaue Rice Terraces, a UNESCO World Heritage site. Vanessa Gumban, my high school classmate and former partner-in-crime, asked me to promote this event, sponsored in part by her class in the UP College of Law. 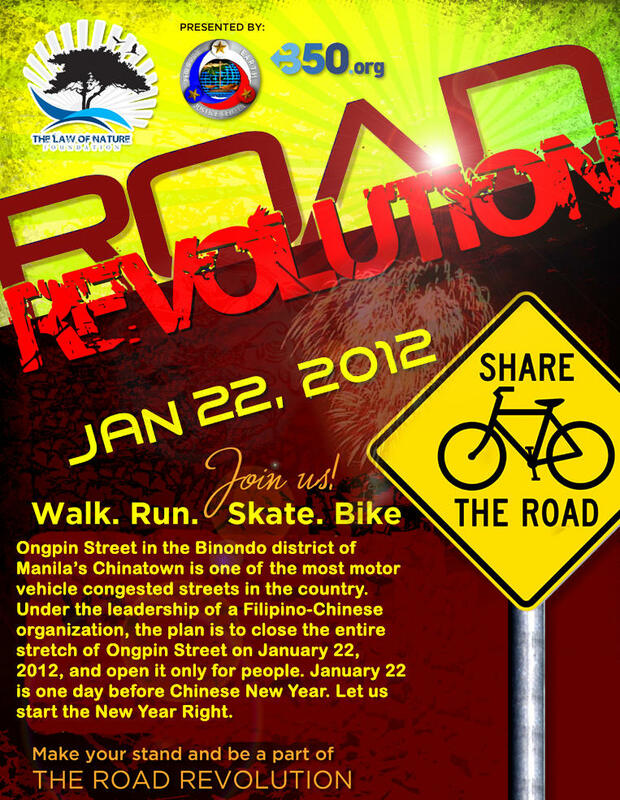 I don't normally promote events in this blog, but this is Vanessa, and I happen to like going to Binondo. I go there when I'm bored or broke. I'm pasting the promo material in its entirety. It's worth reading. 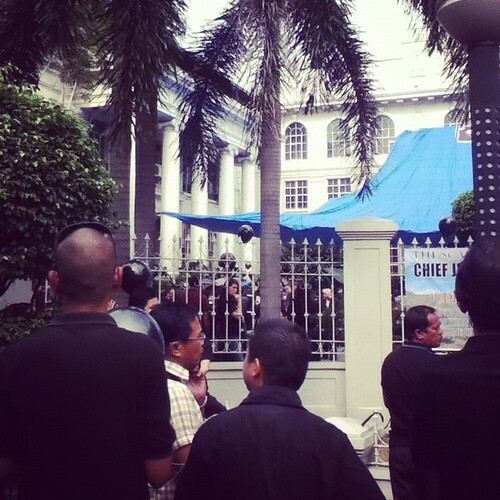 On my way to the barber a couple of minutes ago, I saw mass being held at the Supreme Court compound. 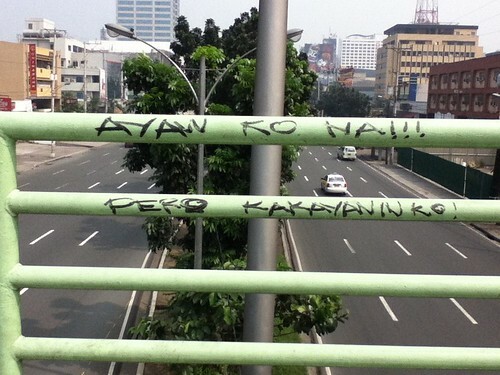 This is in light of Chief Justice Renato Corona's impeachment trial, which has hit the headlines recently. The crowd along Padre Faura Street was big. The media people were there, some lawyers, and loyal supporters, I suppose, many of them carrying black balloons and wearing black shirts. Unfortunately I had a black shirt on, too, only without the catchphrase, "Hustisya Para Sa Korte Suprema." (Mine read, "No Bands, No Glory"). I blended right in. I got to take a couple of pictures, too. This was history unfolding! But lest I be mistaken for a supporter—which I am not—I walked faster. Clearly this was the wrong time to wear black. I was in Pasay City East High School this afternoon, facilitating a small group discussion on infectious diseases, explaining what the kids should do when they have cough and colds. When I briefly mentioned diarrhea—which I translated in the colloquial as "pagtatae"—I saw them automatically turn towards one another, high school teenagers that they were, and they threw fart jokes, generating quite a hilarious commotion. "O, tama na 'yan, balik tayo sa pinag-uusapan," I said aloud. I had only been speaking for three minutes, but my throat was already aching. I had to compete with the incessant chatter of oily-faced adolescents in my midst. For a teacher to thrive in such an environment, day in and out, is nothing short of noble. I recall that months ago, during the first time my group and I visited the class, Everlasting, located right up in the fourth floor of the newly erected building, thanks to a politician whose name I can't recall, I was shocked at how chaotic the scene was. "Were we ever like this in high school?" we asked ourselves. I come from a special science program of a public high school, but I was familiar with scenes like this happening in the regular and lower sections. My other groupmates, all of them girls, mostly graduated from conservative private Catholic schools, so it was more a shock for them than it was for me. So picture us there, helpless and useless. Students were coming in and out of the classroom. Male students formed a huge cluster at the back, almost resembling a fraternity. I could hear invectives and coarse jokes being spewn like geysers. Meanwhile some girls were busy combing their hair. They were insulting each other with harsh words. But what surprised us was seeing both male and female students applying too much baby powder on their faces. Since then we jokingly referred to them espasol girls and polvoron boys, but only when we spoke among ourselves. The times had changed. There are so many things I love about Sherlock, the TV series produced by BBC. Each episode takes about 1.5 hours, almost as long as a short film, but equally as engaging as the best thrillers. While for many shows, adapting classical themes to their modern versions has posed some problems, we don't see that kind of dilemma here. The show is never trying too hard to be the modern rendering of the classic detective stories by Arthur Conan Doyle. The challenge for any viewer is to dissociate previous mental images of Robert Downey Jr when looking at this Sherlock. In the BBC series, Sherlock is so British he's almost a snob. At first glance he's hardly charming but you go on to like him—it's inevitable—especially when he rattles of the list of clues he's used to deduce a particular detail. Benedict Cumberbatch is perfect for this role. I have poor memory. No, really. In a sense, this explains my visceral need to keep a diary, an online journal, an organizer, to write both significant and random things down on paper. 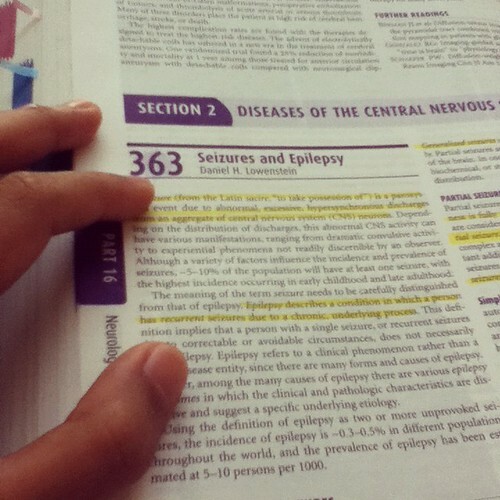 Who is it who said than pen and paper are better than the sharpest memory? Now that my Week in Photos Project is over—and let me say I enjoyed the challenge of taking seven pictures a week, even if I started rather late in 2011—I find fulfilment at seeing all the cameraphone photos I took. Not that I think they're exceptional, but that they have in some way captured the fleeting moments of the year . . . moments that would otherwise have been buried in the floating annals of forgetfulness. Not only once did I feel like quitting this project, but I'm thankful I persevered to the end. Photography fascinates me. My wish is to someday own a huge, heavy camera with lenses that are meters long. 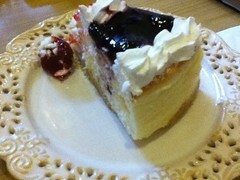 But the Lord only gave me a humble one-megapixel cameraphone, and I couldn't complain: it has done the trick. Together let's look back at the year that was. I picked my favorite photos in the Project, arranged according to theme. I dragged Manong Ralph to the Met Museum today to view Pablo Picasso's The Suite Vollard, a collection of the Spanish artist's etchings between 1930 to 1937. 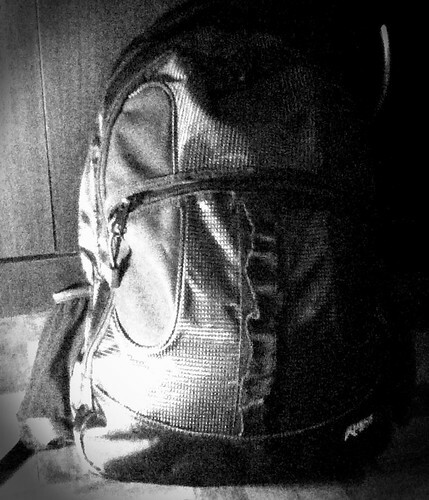 Halfway through the commute (we came from Quezon City), he realized he forgot to bring any money. I intentionally didn't bring any cash so he'd be forced to treat me. Should we go back and get his money? We realized that if we pooled what what left in our wallets, though, we could still eat a quick brunch at a fastfood--nothing fancy--pay for the Php 100 entrance fee each person, and just have enough to pay for an FX ride to QC. But that meant we had to walk all the way from Roxas Boulevard to Taft. Another year has gone. Praise be to God. I've had the opportunity to read a number of books in 2011 mainly because of two things: my academic load is much lighter now, and I own a mobile reading device. In this entry I hope to document each book I had a chance to read. Each of these has contributed to my personal growth in some way. 1. 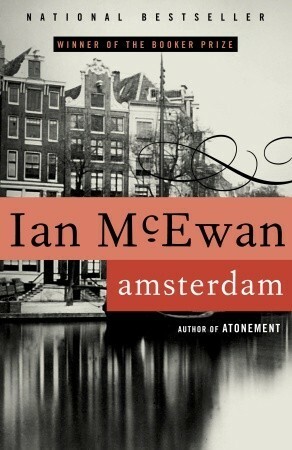 Amsterdam (Ian McEwan). I read this book before going to Amsterdam to get a feel of what the city was like. It turned out only the last chapters were set in Europe. The novel opens with two old friends attending the funeral of their lover, Molly. In the process they make a pact whose consequences have major moral implications—can euthanasia, for instance, ever be justified? I'm a sucker for McEwan's prose; he can both be comical and philosophical at the same time.